A pomegranate is a softball sized fruit with a tough deep red skin. Though the outside is tough the inside is full of little bead-like pockets full of red juice that is sour and sweet! They are delicious. It is Antioxidant-rich, which is good for the heart, other various parts of your body, and skin. It is to be said that the Pomegranate is a good food to eat to decrease the chance of getting a heart disease. It also lowers blood cholesterol and may lower the risk of a stroke! Some scientists have found that Pomegranates actually fight some types of cancer. Along with the cancer cells it also kills some types of harmful bacteria. What happens if you get too much or too little? It is hard to eat "too much" Pomegranate unless it is the extract or juice straight. Even then, It's not known how it affects the actual body. Nothing much will happen because you get a lot of the things that pomegranate gives fromm other things. If you are a perfectly fine person without medical issues that is. What nutrients does it have? 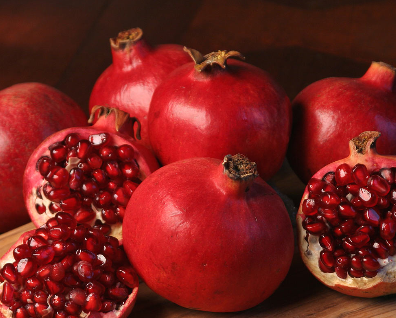 Why is it important for you to eat the right amount of the pomegranate? It is important because if you eat the right amount the reward is much greater then the consequence. When you eat the right amount a lot of good things can happen to your body in a positive way. What is the daily recommended amount of fruits and vegetables to consume? Well you've probably heard the phrases "eat plenty of fruits and vegetables" and "Americans just aren't getting enough", but who knows how "plenty" and "enough" are? Well, for most girls our age ( 9-15 yrs ) you should consume about 1.5 cups (one and one half) cups of fruit a day. As for vegetables: 2-2.5 cups (two to two and a half cups) a day. For boys, (same ages): 1.5-2 cups (one and a half to two cups) of fruit, and: 2.5-3 cups (two and a half to three) vegetables a day. How can I maintain an healthy diet? You can maintain a healthy diet by eating the recommended amount of fruits and vegetables, drinking about 8 cups of water daily, and getting at LEAST 30 minutes of exercise a day.